PR pros have known for a long time that getting journalists’ attention has become more difficult than ever before. Consider that between 1994 and 2014, newsrooms have shed over 20,000 jobs, representing a 39 percent decline. Today, to generate earned media placements it involves deep research into what outlets are appropriate for a story, what angles or themes those outlets cover and an understanding of the best ways to reach out to individual media contacts. All these activities become easier, faster and more effective when organizations have the right media database at their disposal, but that means getting the go-ahead for making such an investment in the first place. And as any communications professional knows, that can involve a considerable education process with senior leadership. The merits of a media database might seem self-evident to you, but to gain executive buy-in you’ll need to articulate the value to senior decision-makers. You also need to keep in mind that those decision-makers may be evaluating any number of competing investment priorities at a given time. So, where should you begin? Think of this eBook as your toolbox for crafting your business case, whether you’re making the pitch to a VP, CMO, CFO or even the CEO. Of course, having a media database doesn’t guarantee you’ll get the coverage you want. PR professionals still need to use all their experience and talent to engage with journalists in a way that develops a strong relationship. The database, however, is the tool that positions you for success. Leaders are human — they have biases, assumptions and personality quirks that will have a bearing on the decisions they make, and the way they make those decisions. In this case, those variables may be even more important to consider because, unless they became CXO through a succession of marketing roles, most senior executives may not have direct familiarity with a media database. They may also have worked in organizations — such as entertainment companies, political organizations and so on — where achieving earned media was once a relatively straightforward process of keeping in touch with a tight circle of outlets. Although things are changing quickly, most senior leaders are not “hands on” with the technology solutions that their teams use on a day-to-day basis. Just like using a media database to get a better sense of what interests a journalist, getting executive buy-in is all about creating a really tailored pitch. In this case, you’ll be drawing upon what you already know about the leader’s attitudes and outlook. Several years ago, Marketing Sherpa created its own cheat sheet for getting executive buy-in by trying to define the seven most common CEO “personas.” These personas were given simple descriptors to show where they were most deeply focused, such as “sales CEOs,” “finance CEOs,” “legal CEOs” and even “serial entrepreneurs.” Then, each persona was ranked according to whether they are more reactive in their decisions or visionary in getting ahead of trends, how customer-centric they are and even whether they respond better to stories or statistics. While these personas should be considered as guides or jumping-off points, they are also a good mechanism to strategize about how to bring the idea of a media database forward. A finance CEO, for instance, might be most interested to understand how a media database could boost productivity by saving time or saving costs that might otherwise need to go towards paid and owned media campaigns. A legal CEO might respond to a pitch about how forging relationships with the right influencers will change the thinking among investors or shareholders. For a sales CEO, it’s all about how a media database can lead to more earned media coverage, which in turn drives more customers to learn about and purchase your firm’s products and services. CEOs aren’t the only leaders to be oriented around a particular focus area, of course. In some organizations, it won’t even be the CEO who makes the call but the CFO or even the CMO. In other instances, you can improve the odds of obtaining executive buy-in by mustering support among some of these other leaders, particularly if they feel they’re part of a consultative process. Getting media coverage can be helpful to sales teams who want a conversation-starter with customers and prospects, but that may not be enough for them to understand why a media database could be a game-changer. Instead, it may help to compare and contrast the technology with one they’re more likely familiar with: customer relationship management (CRM). Instead of the days where sales reps kept a private Rolodex of customer contact information, CRM brought that data into a centralized place where it could be accessed from anywhere and used to fine-tune the way they approach a particular sale. Explain how, in a similar way, a media database can offer at-a-glance background on everything needed to get the organization’s story in front of the right eyes. If sales leaders believe media coverage can get the team’s phones ringing, they’ll most likely be willing to put their weight behind a database and even monitoring features. Even if marketing and communications teams are siloed in an organization, there’s more of a shared understanding here of how you get traction among the right audience through the proper use of data. Most senior marketers, for instance, have been spending the last several years on marketing automation and social listening tools to get a better sense of what drives engagement and real conversion among consumers and even business buyers. CMOs are also starting to rethink the way they allocate budgets towards paid, owned and earned media. An article on CMO.com, for instance, looked at a campaign that saw 81 percent of conversions come through earned media, even though it had received the fewest dollars. This could be why, according to a survey of 100 Association of National Advertisers members in May of 2017, 62 percent of respondents said they plan to increase internal public relations staffing over the next five years and 75 percent said they planned to increase overall spending on PR over that same time period. The other dominant trend in marketing recently has been the move to more personalized, contextualized messaging. Marketers have been increasingly told by almost every expert imaginable that they need to strive for “one-to-one” marketing rather than pushing out the same generic message to the masses. A media database does exactly the same thing for PR professionals who are trying to engage journalists — an audience that demands personalization in story pitches and tends to react negatively when they don’t get it. While they’re obviously the most technically savvy leader in the C-suite, CIOs have been aggressively working to reposition themselves as business strategists, moving out from the shadows of data centers and into projects that have a more direct bearing on company performance. CIOs will readily understand what a media database does, given they may have overseen the deployment of enterprise resource planning systems and the like. Instead, talk to them about how a media database can contribute to larger efforts they might be making towards digital transformation (DX) — the trend whereby organizations try to make the most of digital tools and connect with stakeholders through digital channels. The strategic use of a media database can be a perfect example or proof point about how investing in the right tools can bring value to the rest of the business. A media database can also address another key concern for CIOs: the proliferation of “point products” or a laundry list of applications that constantly get added in piecemeal fashion across the organization. 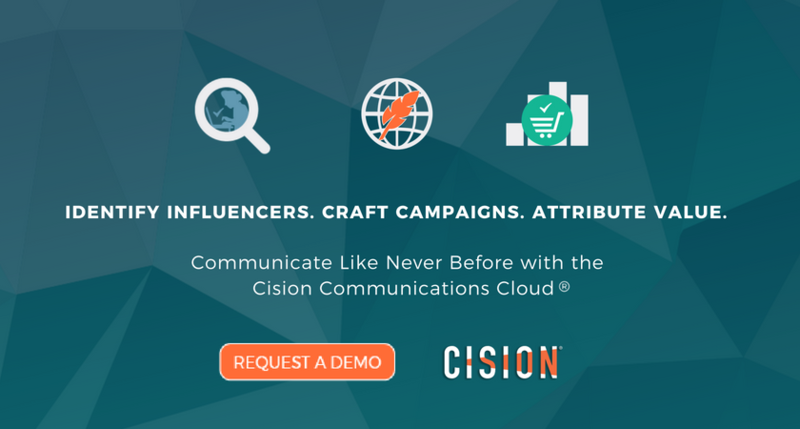 Having a single platform to handle everything from targeting to monitoring analysis like Cision Comms Cloud™ keeps the tech “stack” they need to manage less complex — and CIOs are always interested in reducing complexity and cost. Most of us understand the basics of return-on-investment (ROI): you need to somehow make at least the same amount of money back by using the new tool as you spent on it. In practice, however, explaining ROI to secure investment and commitment from senior leaders involves more than just those two sets of numbers. In 2015, a group of researchers published a study in the Harvard Business Review that looked at how middle managers in all sorts of organizations achieved executive buy-in for new products and initiatives. They referred to it as “issues selling,” where managers focused less on the nuts and bolts of a product but tied their request to existing targets within the company and framed it as a solution to longstanding or urgent problems. Communications professionals need to do the same kind of “issues selling” when they talk about a media database, looking for potential ROI that extends beyond their own function. In an organization where hiring the right talent is difficult, for instance, an increase in media coverage could position the organization as the employer of choice for those with certain kinds of skills. Another company might be focused on boosting sales of a certain product — the ability to encourage media influencers to test it out and write reviews could drive more online searches for the product, which then tie to transactions on the e-commerce section of the website. But, if you don’t have a database, finding the right influencers can be a real challenge. This is not unlike the way many PR professionals successfully pitch the media —they “sell” a story that editors and reporters will want to tell. Beyond the human interest in the best PR pitches, of course, numbers are often a key ingredient. That’s why, in addition to a media database, any discussion with the executive team should also include added value of monitoring tools. Being able to provide deeper analytics on the results of a particular earned media campaign, for instance, could bring reassurance to the leadership team that they will see regular reports that can be integrated into other key performance indicators the organization follows. Option A, for instance, could focus on investing in a media database and demonstrating the range of impacts it can have on the business. This, of course, would also be the lowest cost option. Option B would look at the combination of a media database and also monitoring, and how that would bring additional value. This is your middle price point. Option C could look at a more holistic investment in a platform like Cision Comms Cloud which combines a media database, monitoring, and content distribution. Finally, this would have a slightly higher cost but would offer the biggest benefit to your business by mapping directly to key business metrics like revenue impact. As each option is presented, be prepared to spell out the differences in ROI and how they relate to the issues that matter to the organization. Different options have different cost/benefit ratios, so while budget might be the number one issue for your VP at the outset, influencing factors might compel him or her to go with a more expensive option if it more clearly brings value to the business, or can show overall cost-efficiency by consolidating existing point solutions into an integrated stack. There’s a reason major e-commerce services like Amazon have a little area on every page of their site that says, ‘other customers bought …” or “most popular.” Our brains like these recommendation engines because they help reinforce the decisions we make about everything from the content we read to the purchases we make. Those holding the purse strings in any organization operate much the same way, which is why case studies are a mainstay in the B2B purchase process. You may have first learned about a media database, for example, through what could be described as the old-fashioned case study — word of mouth. A former colleague or a peer in a non-competitive organization may have discussed how a database and monitoring tool has contributed to an improvement in their department’s performance, that of the overall company or (most likely) both. Don’t Make Them Read on the Spot: Include links or attachments to any relevant case studies in the meeting invite or forward on as prep materials or background reading. They may or may not have the time to go through them, of course, which is why you might want to create your own cheat sheet or summary slide if you’re using a deck that gives a one-line synopsis of the biggest benefits other organizations achieved. If there are questions, you’ll have the full case studies ready for them to consult — maybe in hard copy that they can mark up or look through later. Build a Story Through the Case Studies: Rather than heap a pile of case studies on executives as irrefutable proof points, think about how you can weave case studies into your pitch. Think of the last business book or eBook you might have read, for example. Authors frequently insert real-life examples to back up the arguments they make as sidebars, and you can use case studies in a similar way. Or, organize the case studies you bring forward based on the urgency of your organization’s objectives. If you have a case study that speaks to how a media database can contribute to a goal that needs to be accomplished by the end of the quarter, for instance, that’s obviously the one you should lead with first. Turn Case Studies Into Creative Assets: Think of asking for a media database as a sort of internal marketing campaign to the C-Suite. If you won’t have the time to use case studies (other than a brief mention by company name, for instance) during the initial meeting, think of how they might be raw material you can use to nurture demand afterward. Maybe you could take the most compelling stats or takeaways from the case studies you’ve found and develop an infographic that illustrates the power of a media database and monitoring tools. If there are video versions of the case studies, create a collection of them you build into a one-off “newsletter” that gets distributed to key decision makers as part of a thank-you for taking the time to listen. Or better yet, make a simple video where you or someone in the organization talk about the takeaways from the case studies and reflects on how your organization could take the technology even further. Of course, case studies are by definition about successes that happened in the past. You’re focused on your own organization’s potential future, but don’t let that limit you. Instead, think of what might happen if you made your pitch for a media database by using the same format — customer profile, problem/challenge, solution, results — to paint a picture of what that future success might look like. When communications professionals or PR agencies conduct media training for executives, they make sure their subject matter experts are ready to contend with potentially controversial questions about areas that could damage the organization’s reputation. Thinking about these worst-case scenarios ahead of time ensures that executives don’t appear flustered, or that they’re trying to hide something from journalists who are watching closely for a possible scoop. That approach to media training actually applies very well to securing executive buy-in. Just like a media interview, the time available to have the conversation may be relatively brief. Just as journalists are trained to be critical and skeptical, so are senior business decision-makers. One of the biggest differences, though, is unlike a media interview, executives won’t just be asking questions but providing their own viewpoints as part of the discussion. “Can’t you just do a scan around online? For decades, the most likely media outlets that would cover a particular organization were relatively well known and seemed securely established. This could have included national newspapers, local newspapers, trade or B2B magazines, TV and radio. As the media industry grew, keeping up with new outlets might have been challenging but doable. Today, it’s impossible. First, consider how quickly coverage opportunities are diminishing as more outlets consolidate or disappear altogether. A research study from the Public Policy Forum last year suggested at least a third of journalists in Canada alone have lost their jobs over the past six years. Even for those that are still in operation, they have had to make tough decisions about where to allocate their resources. A report from Pew Research, for example, showed that local newspapers in 21 states no longer have a dedicated reporter covering the activities of the U.S. Congress, arguably an important political beat. These changes can happen quickly, affecting earned media strategies while they are still being executed. The launch of new outlets over the same period, meanwhile — including Axios, The Outline and countless others — may not immediately come up in random online searches. It can be equally easy to miss coverage opportunities in non-traditional outlets such as blogs, video series, podcasts and other emerging formats. There is no such thing as “the usual suspects” in media anymore. This fluctuation isn’t just limited to the numbers of outlets. It leads to major changes in the specific people who work there. As in any industry that goes through massive disruptions, editors, reporters and other journalists are constantly changing roles, beats and moving from one employer to another. This is one of the reasons why Cision’s media database, for example, makes more than 20,000 updates to its records every day — and why it’s not a job a single human being can be expected to manage. If creating an effective media list was nothing more than a series of names, titles and phone numbers, Excel might do the trick. But a media database allows corporate communications professionals to get details on beats, editorial calendars, pitch preferences and other information that is critical to making outreach efforts successful. Trying to build that into a spreadsheet would only result in a mess of rows and cells so difficult to manage that likely only a single individual would be able to do so. That’s the kind of siloed approach that most organizations have been trying to move away from in other areas of the business. Tools like LinkedIn, meanwhile, may allow searches for certain roles, publication names and individual names, but LinkedIn was never designed as a media database. It’s a career platform for professionals and recruiters — and the onus is on the individual professional or organization to keep it up to date. It won’t have the power of a media database that brings accuracy along with the potential to add additional capabilities, such as monitoring and reporting. In any other area of business, conducting due diligence or “doing your homework” requires professional tools. PR and communications professionals are now being held to a higher standard. As their budgets diminish, they are at the same time struggling to perform basic job functions necessary for earned media coverage. In Cision and PRWeek’s 2017 Global Comms Report only 32 percent of U.S. respondents said they were always able to effectively identify the right influencers to target and, in turn, impact customer behavior. Bottom line — PR and communications professionals need the right tech tools to do their job effectively, and yet most will be ill-equipped to do so if they can’t get buy-in to make the tech purchases they need. There’s no excuse for putting a story suggestion in the inbox of a journalist who has never covered, nor would ever consider covering the proposed topic . . . Not only is it imperative to research the journalist before dashing off a story pitch, but it is equally important to have a thorough familiarity with the story’s context and any trends or developments that contribute to or take away from its newsworthiness. The numbers back this up. According to Cision’s most recent State Of The Media Report, 82 percent of journalists say PR professionals can improve by researching and understanding their media outlet. There’s no doubt that tools like Twitter have radically transformed how journalists connect with their audiences. The reality of the average social feed, however, is a “blink and you missed it” scenario, where journalists might announce a job change or coverage change in a single tweet that soon disappears under numerous others. Good luck keeping track of that, even if you build a series of Twitter lists and have the time to scroll through them all day long. Unlike a media database, there’s also no agreed-upon consistency or standardization in the way information is entered on social media, from what hashtags are appended to posts to what information is included in bio areas. Social media platforms also don’t give enough information about who is trending with a certain audience, and who has the power to influence consumer behavior. Followers and Tweets alone are not sufficient indicators of an influencer’s true potential to reach your target audience and influence their buying cycle. For that, you need a database that connects the dots between your audience and the journalists that are particularly effective at reaching the audience on the specific topic you are pitching a story for. On the other hand, just point to a handful of recent news items where your organization was left out of the discussion. How might that missed opportunity be turned into an avenue for bringing an important message to some of your key stakeholders? Just as companies are constantly looking for prospects in addition to serving their established customers, a media database allows an organization to be proactive in seeking earned media opportunities. This includes sharing thought leadership about industry trends, for instance, or providing perspective on the news that reinforces the credibility of the company among its target audience. Just as other areas of marketing are based on building brand affinity and preference, a comms strategy that gets its subject matter experts pulled into media coverage is more likely to be top of mind, and heard, when it has news of its own to share. Until recently this wasn’t hard to do. A media company was one that owned the right assets — a printing press, a broadcast network — and employed professionally-trained specialists to create content. Then came the internet and social media. Now we talk of “influencers” and look at social platforms like Twitter and Facebook as media distribution engines. Where there were once only editors and reporters, there are now bloggers, videographers, Instagrammers and others who may be telling stories for profit, out of a personal passion, or both. These influencers may be just as open to picking up story ideas from PR professionals — provided those professionals can easily find them. Thirty-One Gifts raises a final key point around gaining executive buy-in. For any kind of major investment, leaders may decide there’s no downside to doing nothing. In other words, while the benefits of something like a media database are clear, the costs or other considerations may make them decide to stick with the status quo. Competitors, however, are rarely standing still. Market conditions change constantly. There is a reason why the business community has been so focused on the word “disruption,” and how digital technology is creating new entrants and unexpected changes to entire business models across transportation, retail, finance and almost any other sector. What happens when other firms get greater attention from media, with their experts becoming the strongest voice in conversations about trends and news across the industry your firm serves? What do these missed opportunities mean in terms of brand perceptions, corporate reputation and the mindshare among customers the sales team is trying to attract, convert and retain? These are all elements that need to be woven into the story comms professionals tell. The business case for a media database is not simply a matter of asking for money. It’s about laying out a vision and a strategy for corporate communications that accelerates the entire organization’s ability to achieve its most challenging objectives. The technology is a critical means to an even more critical end. Out of all the other stories that comms professionals bring forward, this could wind up being the most important pitch you ever make.